Disable Auto-Restart for Auto Updates (Windows XP) - TACKtech Corp.
Automatic Updates will notify the user that the computer will automatically restart in 5 minutes to complete the installation. Change the Auto-Restart setting so, Automatic Updates will not restart a computer automatically during a scheduled installation if a user is logged in to the computer. Instead, Automatic Updates will notify the user to restart the computer. Note: This policy applies only when Automatic Updates is configured to perform scheduled installations of updates. 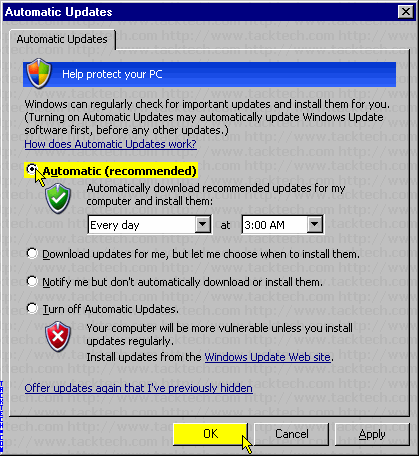 If the Configure Automatic Updates policy is disabled, this policy has no effect. 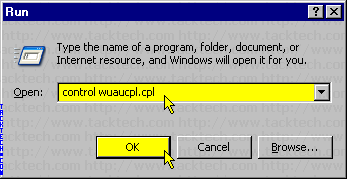 Type control wuaucpl.cpl into the Open: textbox. Click the OK button to open the Automatic Updates settings. Select the Automatic (recommended) option. Click the OK button to launch the Group Policy Editor. 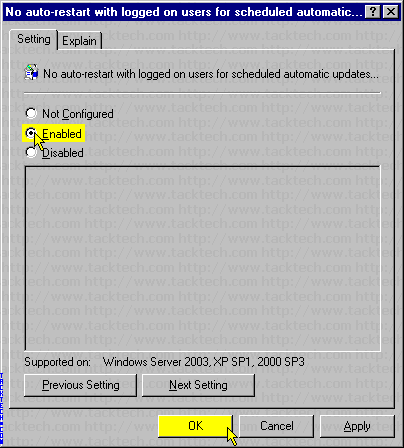 Double click No auto-restart for scheduled Automatic Updates installations in the right pane.